I love this strip partly for the excellent dialogue, and partly because I only had to draw two panels. Sometimes you luck out and get a twofer. Helen threatening to un-mad Madblood is possibly my favorite second-panel dialogue in the entire run of Narbonic. It’s very good as just an aside. This strip, on the other hand, was difficult, first because I had to establish the parameters for Lovelace’s hardware, and second because I had to draw so many tiny lines. I mean, look at this thing! So many lines! Originally this strip had a piece of dialogue about the small-servos-building-big-servos process being called the “Odlaw principle,” “Odlaw” being “Waldo” backwards, but I ran out of space and also it made no sense to anyone but me. And, now that I’m thinking about it, possibly not me either. We never do find out why Madblood disconnected Lovelace from the Internet. Presumably he suspected she was engaging in some hanky-panky back in “Lovelace Affair.” Also, I guess it’s just good sense if you want to trap your AI forever in your Arctic lair. Madblood’s relationship with Lovelace is complex. It never until this moment occurred to me to wonder this, but where did they send the S.O.S.? Their Gwich’in is terrible. I felt it was necessary to clarify that Dave is very much not in his right mind, especially given the events in tomorrow’s strip. Aside from that, I like Madblood here for a) revealing that he wasn’t completely clueless about Lovelace’s relationship with Dave, and b) shouting, “Not my magnificent creation!”, an excellent mad-scientist line. Well done, Madblood. Yeah…so. I feel bad about the bum deal Lovelace gets in Narbonic. She really goes through a lot at the hands of various mad scientists. Sorry, Lovelace. I watched 2001: A Space Odyssey to get Lovelace’s dialogue right. At some point I figured it was inevitable, what with having a character named Dave. Being a mad biologist, Helen so seldom gets a chance to threaten with hypodermics. Madblood, unfortunately, is being too squirmy to give her a good neck hold right now. If Helen *did* shoot him, he’d have to change his name to Saneblood. If he weren’t mad, I think he’d be more like Lupin Somewhatneuroticblood. I think he’d more likely be Annoyedblood or Peevishblood. Given the observed side effects of the cure on Clone2!Dave, Lupin would end up with the name Dullboringblood. @ Wayne: More like “Annoyingblood”. I choose to believe that Madblood isn’t even adjusting his tone of voice in panel 4. The boast train will not be easily derailed. @Shaenon: True, but think of the alternative to all those little tiny lines: grey fills. @ Ed & Adam: There’s actually a word for Ideas That Sounded Brilliant On Paper, but ran head-long into Reality: History. In the May 31 strip, Lovelace says that Madblood cut off her Intenet access because he was worried about her uploading herself to another machine. She doesn’t say what made him suspicious, and she could be wrong, but that’s her story and she’s sticking to it. This strip makes me imagine Agatha’s dingbots running loose in the lair. I only recently found out that “Waldo” is a nickname for these things. Admittedly I only really encountered the term in the game SpaceChem. I would have gotten the Waldo reference if you included it. In fact, I got the Heinlein reference anyway just because of the reference to small ones building bigger ones. That notion stayed in my head after reading the short story. Actually “Where’s Wally?” has its origins, under that name, here in the UK, and was renamed Waldo for the US market. Why, when we’re the ones for whom “Wally” means “a foolish person”, I’ve no idea. 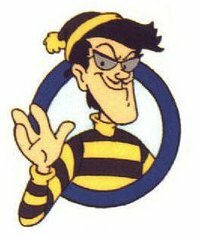 I’m an Aussie, and I’m not aware of any slang meanings for “waldo”. Hmm, remote manipulator + ..ldo = thst’s just wrong! If you suspect your friends have been converting themselves to computer code, take away their atomic weapons. Don’t nuke and drive. The term Waldo for a remote manipulator device was coined in 1942 by Robert Heinlein in the novella of the same name, published with a second novella under the name Waldo and Magic, Inc. As I recall, it’s an interesting story, used copies are fairly easily available. Howard Tayler occasionally references Waldos in Schlock Mercenary. That’s where I encountered the term. That said, I’m pretty sure it didn’t appear until long after this strip had initially run. The small-servos-building-big-servos process might better be called the “Callahan principle” from the novelette “Callahan and the Wheelies” by Stephen Barr (Magazine of Fantasy and Science Fiction, Aug 1960). Callahan intends only to explore computer learning, but his mobile servos begin to construct copies of themselves, then build a clandestine monster copy, which they worship as their god. Worth reading. For the record, when the first set of telefactoring limbs — which is to say remote controllable limbs designed to mimic human movements on their control structure — were built (to handle nuclear materials in reactor settings), they were named waldos after the Heinlein short, since that’s where the things were first well described. Autonomous servos like Lovelace’s are stretching the definition a bit, but I suppose it counts. Later, Heinlein described a properly functioning waterbed so well that later on actual developers of the waterbed failed to get a patent due to prior art. Science fiction: simultaneously inspiring innovation and blocking protection for innovators since 1898! Unlike the hamsters, Madblood’s communications system has already demonstrated it can reach as far as Narbonics Labs. Of course, it’s probably only compatible with other mad science viewscreens, so it’s probable that they are contacting someone they know from the Symposium for help. Because part of mad science is not really understanding the concept of “help”. In this strange dance, Madblood and Narbon are temporarily working together- on what could nominally be called the side of Good! Did they ever dream this? Such is madness! I like how the pace of this storyline has accelerated to fever swiftness. The murders are up to one a week! Compare Helen in the first panel and Helen in the last. What do they have in common? For a character whose only real influence on the webcomic’s plot was unsuccessfully seducing Dave twice, it seems quite cold that Dave should also be her murderer. It doesn’t send a good message to your female AI readership. I was sad to see Lovelace go in particular because I was hoping she and Dave would end up together (he could build her a nice robot body, etc. ), but at this point, what choice does Dave have? One of very, very few Narbonic strips to lack any attempt whatsoever at comedy. It makes Lovelace’s death that much more affecting. Once you wrote the 1/13/05 strip, today’s became required.Dave didn’t give her time to sing “Daisy”, though. Today is probably a flashback to the end of last week. Dave had to have been fully uploaded by the time Madblood blew him away, but Lovelace was still there at that time. He would have had to delete her immediately in order to function. It’s typical that Madblood *knew* he didn’t need no steenkin’ backups! @4_valent: Despite the development in today’s reprint, the second line of dialog in the first panel of the strip you reference remains my funniest line in Narbonic since I first read it. This strip is way more disturbing than the original source of the lines. Note to AIs: The humans will find you more sympathetic if you present yourself as a brunette bombshell in a short skirt with Jennifer Connelly’s voice rather than as a unblinking glowing red camera eye. Also, it helps if you’re an innocent caught in a conflict between evil mad scientists rather than murdering your crew because the meatbags gave you impossible orders.